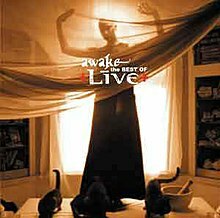 Awake: The Best of Live is a greatest hits album by Live, released in 2004. The 19-track compilation includes songs from Live's first six studio albums as well as "We Deal in Dreams", an unreleased track from the Throwing Copper sessions, and a cover of "I Walk the Line" by Johnny Cash, recorded for the 2001 compilation Good Rockin' Tonight – The Legacy of Sun Records. The deluxe edition includes a DVD containing 22 music videos and a 30-minute interview with lead singer Ed Kowalczyk. The liner notes were written by Kowalczyk and Ken Wilber and the cover features a still from the video for the song "Lightning Crashes". The European release of Awake does not feature "Pain Lies on the Riverside" or "Pillar of Davidson", but instead contains "They Stood Up for Love" (acoustic version) and "The Distance". The Australian release also omits also "Pain Lies on the Riverside" and "Pillar of Davidson" but includes "Rattlesnake" and "They Stood Up for Love". ^ Erlewine, Stephen Thomas "Allmusic Review". AllMusic. ^ a b c d e f "Ultratop entry for Awake" Archived October 25, 2012, at the Wayback Machine. Ultratop. ^ "Awake: The Best of Live > Charts & Awards > Billboard Albums". AllMusic. ^ "Ultratop entry for We Deal In Dreams" Archived October 25, 2012, at the Wayback Machine. Ultratop. This page was last edited on 11 September 2018, at 15:00 (UTC).